April 30, 2012  The Department of Veterans Affairs announced in April that it will add over 1,500 mental health workers to its system to reduce the amount of time it takes a veteran to get an appointment. The announcement came ahead of a new government report that said the VA has been overstating the percentage of new patients who actually get a full evaluation within the department's goal of 14 days. Some veterans in Milwaukee — who say they still are not seen at their local VA when they want — are turning to a free clinic with a different approach to care. April 30, 2012  The White House's chief counterterrorism adviser offered a detailed defense on Monday of America's use of drones against al-Qaida terrorists, including the targeted killings of U.S. citizens. John Brennan's comments come on the eve of the anniversary of the raid that killed Osama bin Laden. April 25, 2012  The U.S. Department of Veterans Affairs has been tightening standards to ensure that vets get mental health care as soon as they need it. Now, a Senate committee has heard evidence that those standards are meaningless, and that some VA leaders are earning bonuses for fulfilling meaningless performance targets. April 18, 2012  Newly-published photos show U.S. troops in Afghanistan posing with the dead bodies of insurgents. The incident, first reported by The Los Angeles Times, occurred in 2010. It's the latest setback for the military's counterinsurgency strategy, which depends on winning the hearts and minds of the Afghan people. March 29, 2012  Pie-in-the-sky reports about vast mineral deposits of copper, iron, uranium and lithium are believed by many in Afghanistan to be the key to the country's future. But a Chinese copper mine east of Kabul is the only one optioned by an international company so far, and it's on hold. March 27, 2012  The popular MSNBC host talks about her start in broadcasting, her life and her new book Drift: The Unmooring of American Military Power, in which she argues that America's national defense has become disconnected from public oversight. March 20, 2012  Sgt. Robert Bales is expected to be charged with murdering 16 civilians in Afghanistan. 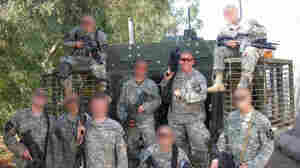 It raises questions about how the military screens troops. Former Surgeon General of the Army, Ret. Lt. Gen. Eric Schoomaker, and Ret. Brig. Gen. Steve Xenakis talk about how the military tests mental fitness. 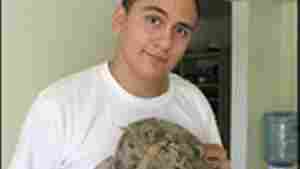 Troops' Mental Health: How Much Is Unknown? March 18, 2012  Service members are generally screened before, during and after deployment. 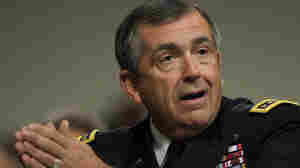 But the Army lacks reliable diagnostic tools, according to former Vice Chief of Staff Gen. Peter Chiarelli. He says what the recent attack on Afghan civilians proves is "just how much we don't know." March 18, 2012  There is still only sketchy information available about Staff Sgt. Robert Bales' recent experience in Afghanistan, but five years ago in Iraq, he was considered an excellent and upbeat soldier. 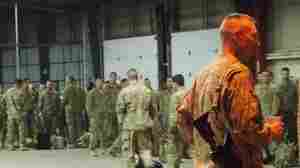 Bales is suspected of killing 16 unarmed Afghan civilians. March 13, 2012  Melissa Block talks with Martin Kaste about the long list of troubles at Joint Base Lewis McChord. The base is home to the soldier that allegedly went on a rampage in Afghanistan, killing 16 civilians. February 29, 2012  On Wednesday evening, President Obama is expected to host a dinner at the White House honoring veterans of the Iraq War. Veterans still face challenges after their homecoming, including a higher-than-average unemployment rate. February 28, 2012  Veterans coming home from Iraq and Afghanistan are facing an unemployment rate twice that of civilians. 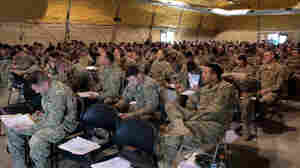 But a consortium of business schools has been teaching service members that their military experience can give them the right skills to become successful business owners. February 24, 2012  In 2004 he nearly lost his life, and a leg, in Iraq. But Canon worked hard at rehab and his doctors performed one of the most extensive limb constructions ever tried. NPR followed his story. Last week, 29-year-old Canon died.